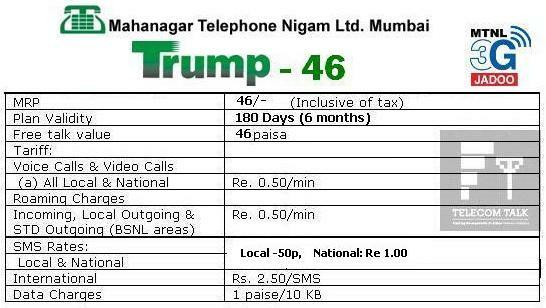 Continuing its leverage of bringing best and affordable Mobile services, India’s first 3G Mobile service operator Mahanagar Telephone Nigam Ltd (MTNL), today announced the launch of new Special Tariff Voucher (STV) “Trump One For All–46” for its existing prepaid GSM subscribers in Mumbai circle. New Prepaid STV Trump-46 (Bonus Coupon Rs.46) offers single and cheapest tariff for all Voice and Video Calls from Home Network as well as National Roaming on BSNL Network across India. Trump “One for All-46” comes for Rs. 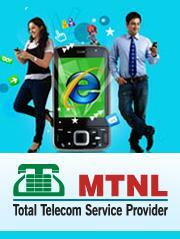 46 along with tariff validity of 180 days from the date of recharge. The plan is applicable for all new and existing prepaid subscribers (2G and 3G) wherein subscribers can now enjoy all Local, STD and Roaming Voice and 3G Video calls just for 50 paisa per minute across India. The STV/Bonus Coupon-46 will be available from 5th August 2011 over on-line recharge system and Flexi /TRS from MTNL CSC across Mumbai, Navi Mumbai and Thane. It is 100% true. Delhi Corporate office issued the letter yesterday. It is withheld till further orders, means they are analyzing their step which they took few days back. I want to activate this STV/Bonus Coupon-46 through there on-line recharge system.. but still there online recharge system is not updated with this Coupon 46.. Lets hope it will made available by evening!! @Sanjay Bafna for your information .. I checked same site at 8am at that time it was not available..